One of the most fundamental ideas underlying the philosophy of social science expressed here and elsewhere is the view that social explanations should seek out the causal mechanisms that underly the social phenomena of interest. So now we need to be able to say a lot more about what social mechanisms are, and how they relate to each other. 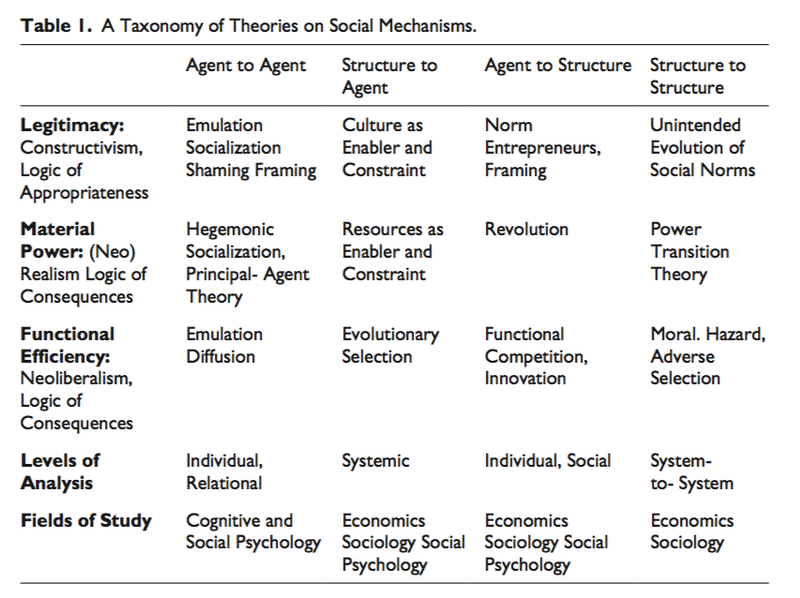 Quite a bit of my own thinking has been devoted to this subject, and in a recent post I proposed that it would be useful to begin to compile an inventory of social mechanisms currently in use in the social sciences (link). There I suggested that it would be useful to find a motivated way of classifying the mechanisms that we discover. Interest in mechanisms is taking hold in some sub-disciplines of political science. 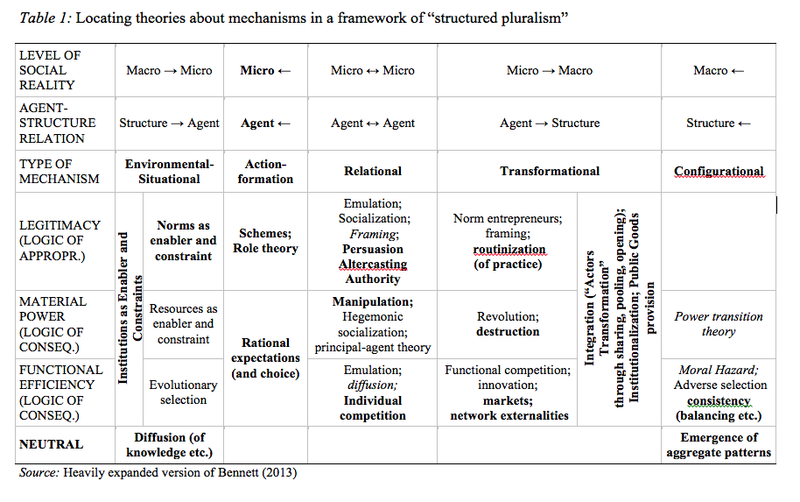 An especially clear statement of the appeal of the mechanisms theory of explanation for political science is offered by Andrew Bennett in “The Mother of All Isms: Causal Mechanisms and Structured Pluralism in International Relations Theory” (link). (Bennett is also co-author with Alexander George of the excellent book on case-study methodology, Case Studies and Theory Development in the Social Sciences.) In the current article Bennett reviews the progression that has occurred in IR theory from positivism and the covering law model, to the idea of high-level “paradigms” of explanation, to the idea of a diverse set of causal mechanisms as the foundation of explanation in the field. He calls the latter position “analytic eclecticism”, and he argues that it is a powerful and flexible way of thinking about the processes and research questions that make up the subject matter of IR theory. I agree with Andrew in thinking that it is useful to find a non-arbitrary way of classifying mechanisms. It is quite worthwhile to make a start at this project. I’m not yet fully persuaded, however, by either of the axes that he proposes. First, the content axis seems arbitrary — legitimacy, material power, functional efficiency. Why choose these substantive characteristics rather than a dozen other possible content features? Is it simply that these correspond to the three primary “isms” of IR theory — neorealism, neoliberalism, and constructivism (as he suggests earlier; 472)? But the thrust of the first part of the paper is that the “isms” are an unsatisfactory basis for guiding explanation in international relations theory; so why should we imagine that they serve to identify the crucial distinctions in content among social mechanisms? Would the content categories look different if we were taking our examples from feminist sociology, the sociology of organizations, or theories of legislatures? Bennett doesn’t assert that these content categories are exhaustive; but if they are not, then somehow the tabulation needs to indicate that there is an extensible list on the left. And are these categories exclusive? Can a given mechanism fall both into the legitimacy group and the functional efficiency group? It would appear that this is possible; but in that case classification is difficult to carry out. Second, the structure axis. Why is it crucial to differentiate mechanisms according to their place within an agent-structure grid? Why is this an illuminating or fundamental feature of the mechanisms that are enumerated? Would this dimension explode if we thought of social organization as a continuum from macro to meso to micro (along the lines of Jepperson and Meyer (link), as well as several earlier posts here (link))? An early question that needs answer here is this: What do we want from a scheme of classification of social mechanisms? Should we be looking for a strict classification with exhaustive and mutually exclusive groupings? Or should we be looking for something looser — perhaps more like a cluster diagram in which some mechanisms are closer to each other than they are to others? We do have several other examples to think about when it comes to classifying mechanisms. In an earlier post I discussed Craver and Darden’s account of mechanisms in biology, and highlighted the table of mechanisms that they provide (link). It is evident that the Craver-Darden table is much less ambitious when it comes to classification. They have loosely grouped mechanisms into higher-level types — adaptation, repair, synthesis, for example; but they have not tried to further classify mechanisms in terms of the levels of the entities that are linked by the mechanism. So they offer one dimension of classification rather than two, and they leave it entirely open that there may be additional types to be added in the future. This is a fairly unexacting understanding of what is needed for a tabulation of mechanisms. Environmental mechanisms mean externally generated influences on conditions affecting social life. Such mechanisms can operate directly: For example, resource depletion or enhancement affects people’s capacity to engage in contentious politics (McCarthy and Zald, ed. 1987). Cognitive mechanisms operate through alterations of individual and collective perception; words like recognize, understand, reinterpret, and classify characterize such mechanisms. Our vignettes from Paris and Greenwood show people shifting in awareness of what could happen through collective action; when we look more closely, we will observe multiple cognitive mechanisms at work, individual by individual. For example, commitment is a widely recurrent individual mechanism in which persons who individually would prefer not to take the risks of collective action find themselves unable to withdraw without hurting others whose solidarity they value – sometimes at the cost of suffering serious loss. Relational mechanisms alter connections among people, groups, and interpersonal networks. Brokerage, a mechanism that recurs throughout Parts II and III of the book, we define as the linking of two or more previously unconnected social sites by a unit that mediates their relations with one another and/or with yet other sites. Most analysts see brokerage as a mechanism relating groups and individuals to one another in stable sites, but it can also become a relational mechanism for mobilization during periods of contentious politics, as new groups are thrown together by increased interaction and uncertainty, thus discovering their common interests. This too is a one-dimensional classification. And it appears to be intended to be exhaustive and mutually exclusive. But it isn’t clear to me that it succeeds in classifying all the mechanisms we might want to bring forward. Once again, this strikes me as a good beginning but not an exhaustive grouping of all social mechanisms. My own preliminary grouping of mechanisms has even less structure (link). It groups mechanisms according to the subject matter or discipline from which they have emerged. But this does not serve to shed light on how these examples are similar or different from each other — one of the key purposes of a classification. I think this is a very useful research activity, and Andrew Bennett has done a service to the theory of social mechanisms in putting forward this effort at classification. Let’s see what other schemes may be possible as well. A good scheme of classification may tell us something very important about the nature of how causation works in the social world. « What drives organizational performance?